As a teacher, my wife has corralled fourth-graders, mentored high schoolers, and endured the rants of countless bemused parents. As a mother, she has changed dirty diapers, cleaned vomit off the couch, and has no reservations about sticking her hands into the goop that collects in the sink strainer after the dishes are washed. She is a courageous soul, yes. There are none braver. I honestly believe this. But she has not ventured near the mailbox for about a week now. She’s scared, she says. Because lurking there far in the back corner is a spider has taken shelter from the cold November air. My wife does not like spiders. Not just the tarantulas or the black widows, either. She’s afraid of the teeny ones, the daddy longlegs, and those little furry black ones that like to hop, too. They are evil, she says, though she lacks the evidence to back that up. On those infrequent occasions when my wife has nightmares, spiders are often the primary antagonist. They’re in her hair or her food, and once they were even in our bed (it’s never a good thing to be awakened at three in the morning by a temporarily insane spouse exclaiming, “They’re going to eat us!!”). Taking care of the spider was my job, which was done easily enough with the rolled up edge of the day’s Wal-Mart advertisement. It didn’t seem like a victory, not even a small one, but as I flicked spider guts onto the grass my imagination kicked in and I began to ponder. What if I wouldn’t have been there? Various scenarios were played out in my head. My wife would have never again checked the mailbox. Days upon days of junk mail and catalogs and bills would have piled up. Especially bills. Bills that would go unpaid, which would eventually lead to the electricity being turned off and then the gas, and then the water. Foreclosure would soon come. My wife and children would have lost everything, abandoned to a life of homelessness and destitution. All because I wasn’t around to kill the spider in the mailbox. Okay, so maybe not. Maybe my wife would have ended up asking a neighbor to kill the spider or she would have just paid the bills online. But still, my responsibilities around the house to ensure domestic tranquility seemed at that moment pretty amazing. I keep the yard and the vehicles up. I do the painting and hammering and sawing. I fix what is broken (and occasionally break what is fixed). I unstop the toilet. I kill the snakes and scare off the bears. I shovel the driveway and seed the grass and take the trash out. When my kids go to bed at night, it’s me they wanted to make sure is in the next room. Not their mother, as important as she is. Their father. Because in the eyes of children, every father is a freaky combination of Old West gunslinger and Jedi knight—big and strong, wise and unflappable. At least, that’s the way it should be. Men have a tough go at it nowadays. We’re not really allowed to be the people our father’s were, strong and stoic and tough. People in these modern times expect men to be in touch with their feelings, to be softer and not harder. Maybe that’s a good thing. Maybe. I don’t know. But I do know this: in the corner of the dining room, right by the backdoor, another spider has taken up residence. I saw it this evening. And I’m pretty sure it saw me, too. I doubt that spiders hold men in high regard. After all, we’re the only people keeping them from overtaking the world. Oh, my! I don’t think my daughter gets her mail any more either. For the same reason. Spiders kill nasty insects. As long as it’s not a brown recluse or black widow, I say live and let live. okay. 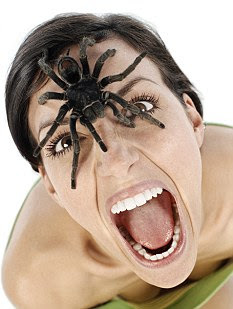 the lead in from your website did not prepare me for the shock of the woman with the spider on her face… just saying… my skin is still crawling and I am no longer seeing the actual photo. Now that I have read it I must tell you a story of my Dad. A huge spider had taken up residence on my parents front porch. Mom wanted it dead. Dad knowing if he sprayed it with chemicals it would run away and die unseen… no proof of death for Mom to garner comfort from. It was a rather large spider… so he used a BB gun. Yup. blew its head right off and left the remains hanging there for proof of its demise. Or maybe it was so others could complement his finesse with a gun? I am glad I have a husband that is my bug killer. He has rescued me from VERY LARGE rats and deadly snakes as well. It is nice to be taken care of. Your wife is a very blessed woman. 1- Okay, who do you think will click that link? Uh, maybe later. 3- I reckon that spider will crawl into her mouth if she doesn’t close it. 4- My then-boyfriend, not-husband took me to Arachnophobia for a movie date night. Thanks to him I check my sheets every night with a flashlight and I shake out ever boot, shoe, sock, and clothing article before use. And guess what? Two times (count ’em, 2!) in the last 22 years a nasty spider dude fell out. Okay, I looked at the link. That is so large and nasty that it doesn’t look real. I think it may actually be a miniature horse.